Olompali State Historic Park is a 700-acre site featuring former ranch buildings and an adobe ruin. The park's long history includes centuries of habitation by native people, the site being one of the largest villages in the region. Existing buildings and roads represent a transition from an important native site to a land under Spanish, and then Mexican rule. The Camilo Ynitia Adobe and the Burdell ranch complex remain. These remnants, set within a rich and changing cultural landscape, provide a glimpse into Olompali's historic past. Select the image below to explore historic Olompali. 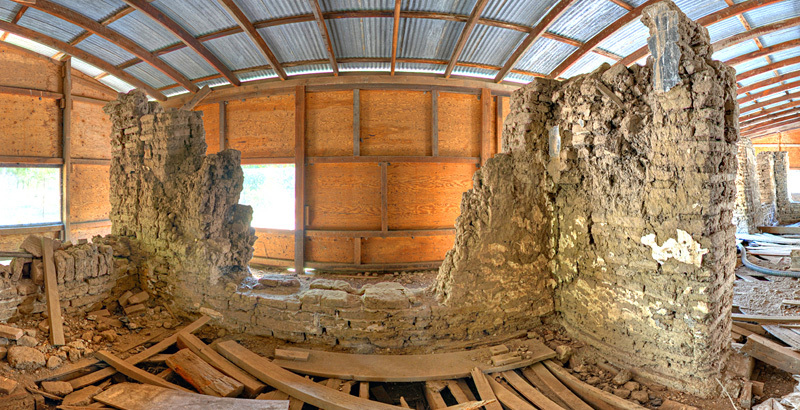 The ruins of the Camilo Ynitia Adobe at Olompali State Historic Park represent a significant period in California history. The adobe is the oldest home and the only remaining adobe in Marin County. The current layout of the adobe ruins form a “T” shape, the same footprint used for the 1860’s Burdell home. The original 1830’s section of the adobe is the north-south running rectangular section located on the eastern side. The portion of the building on the west side was added later. The Camilo Ynitia Adobe offers a number of clues indicating the sequence of construction. Many of the adobe homes built in California during the Mexican era had a common design, usually rectangular in shape, with a wood timber roof structure. A recent laser survey revealed the east side of the adobe did not have square corners or straight walls. The section on the west side was carefully measured during construction. There are other clues indicating changes over time and the sequence of construction. See if you can find these clues as you explore the virtual tour. Why did the adobe undergo so much change between the 1830’s and 1860’s? Select the image below to go directly to the interior of the adobe ruins. 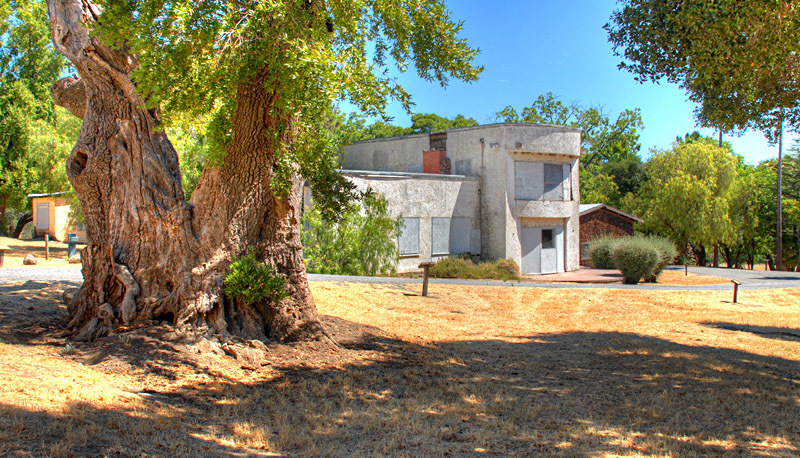 Visitors at Olompali State Historic Park often ask about the significance of the Burdell Mansion, an imposing white stucco building located near the center of the historic ranch. Many find it interesting to learn the Burdell Mansion was really three historic homes contained in one. Camilo Ynitia built his adobe home at this location during the 1830's after the decline of the California mission system and Ynitia's return to Olompali. Rancho Olompali was soon granted to Camilo Ynitia by the Mexican government. Ynitia, a Coast Miwok, was the only native person in northern California to receive a land grant and retain his property for himself and his family. James Black arrived in California long before the gold rush and was acquiring land in the region. He purchased most of Rancho Olompali from Camilo Ynitia in 1852, then in 1862 gave the land to his daughter, Mary, when she married Galen Burdell, a prominent San Francisco dentist. Galen and Mary Burdell began construction on their new home at Olompali during the 1860's. Their wood frame house was built around Ynitia's adobe, the wood frame walls enclosing the thick adobe walls. The completed two story home followed the same footprint as the adobe. In 1911, Galen and Mary Burdell's son, James, began construction on his own larger home, a stucco-clad mansion that enclosed his parents' earlier home, and in turn, the adobe. This 1911 Burdell Mansion we see today extends far beyond the original footprint of the Camilo Ynitia Adobe. The Burdell Mansion burned in 1969, destroying a large portion of the building and exposing the old adobe walls. Today we still see the evidence of the fire and the exposed remains of three historic homes that were once enclosed as one. We continue to have unanswered questions about the historic buildings at Olompali. Every year more information surfaces as we piece together fragments of information and hunt for new clues. We knew Petaluma builder, Hugh McCargar, constructed James Burdell's 1911 mansion thanks to information found in a 1911 newspaper article. But, there have been many questions about its unusual design. We recently found an 1896 newspaper article that described a new hunting club, established by James Burdell and other influential friends. The article mentioned a new clubhouse built in 1895 about a mile from the Burdell home near the Petaluma River. The clubhouse was described as being a large Spanish style building that was designed by Sam Newsom. Samuel Newsom was a well-respected San Francisco architect. David Gebhard, an architectural historian with UC Santa Barbara, wrote about the same clubhouse in 1979 and attributed the abstracted mission revival design to Samuel Newsom and his son, architect Sidney B. Newsom. Gebhard later wrote more about the clubhouse design, comparing elements of the design to Pueblo Revival, noting the stucco and projecting vigas (false timber ends that project from the stucco). The old clubhouse is long gone, but photos of the clubhouse provided by Gebhard bear a remarkable resemblance to the 1911 Burdell Mansion we see today. This provides strong evidence that James Burdell also retained the services of at least one of the Newsoms to design his home at Olompali. This is an example demonstrating how Olompali's history continues to be assembled through new discoveries, careful observation, and analysis. Perhaps you might spot new clues while exploring this virtual tour of Olompali. Select the image below to view the Burdell Mansion up close. 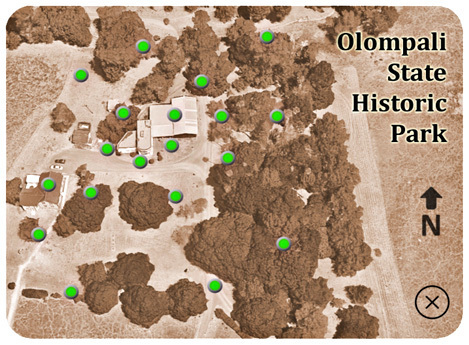 Historic Olompali was created to provide an in-depth exploration of the historic ranch area of Olompali State Historic Park. You may want to use the following features to enhance your visit. 1. Begin your tour from one of the entry points above. 2. Every 360-degree view allows you to look in any direction and to zoom in and out. 4. There are two ways to navigate from one view to another: select an animated white rings hotspot in the view, or select the Open Navigation Map button to open an interactive overhead view. 5. Most views will contain informational text and photo icons. Use these to open a descriptive text panel or an image and caption. 6. A few of the adobe interior views have an ultra-zoom feature allowing you to view an area with extreme detail. Watch for a special Zoom icon. 7. Select the Return to Menu Page button to exit the interactive views and return to this Historic Olompali page. Explore the Camilo Ynitia Adobe with your VR glasses. This is still a bit experimental. The link below will take you to a WebVR enabled tour without interpretive text. So far, this has been tested with Google Cardboard and iPhone 6 only. Select the link below, setup your VR glasses, then select Enter VR to start. This site was created in cooperation with the following organizations. See their web sites for more information about the park.